24 of March, Saturday, 12:00 in Paidiki Hara, Koukaki we are calling comrades, friends, from Athens and all over Greece, all of ages, genders, persons who work, studying, or are unemployed, with animals, with their music instruments and their expression means, to walk together. 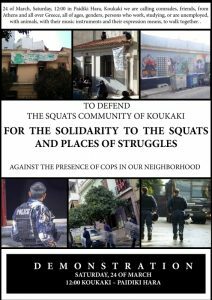 Almost a year ago, a new project bloomed in the neighborhood of Koukaki. 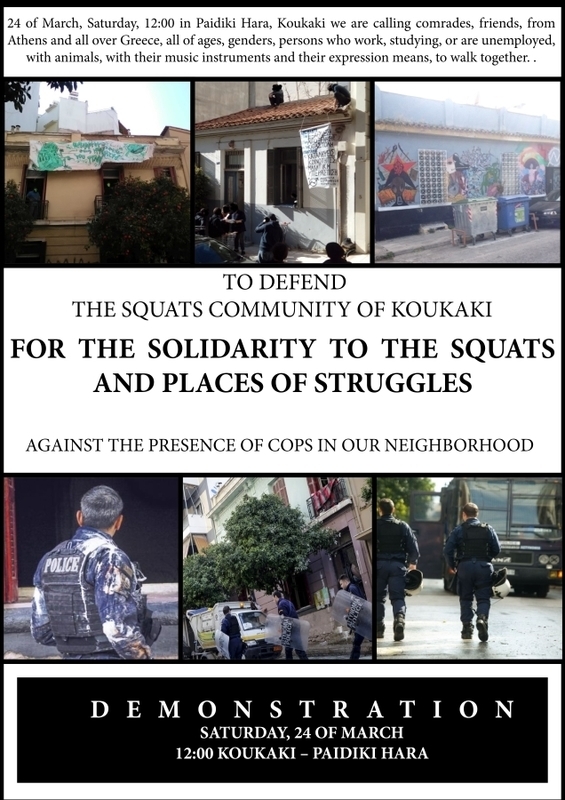 We created a community of housing and struggling squats. We occupied three empty buildings which were getting rotten at Matrozou 45, Panaitoliou 21 and Arvali 3. We rebuilt them through a lot of work to become sustainable, to become places of gathering and communal organization. Some us them are living here permanently.